To give you a snapshot of my previous work I have pulled together some of the press links, videos, and radio interviews from a handful of the campaigns I have been involved in. As you will discover, they are all unique. To date, I have worked on over 40 advertising campaigns. While the majority of these have been with food brands, I have also worked with several other non-foodie companies. 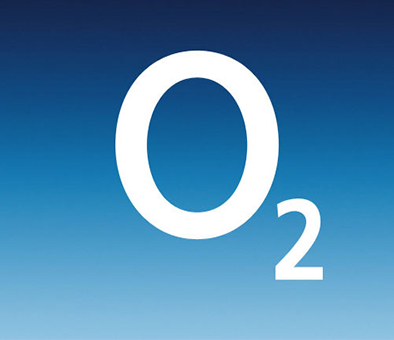 For example, O2 may be the best known for the pioneering work in telecommunications but when O2 Priority Moments wanted to promote their £1 lunch deal, they called me.While not all the brands I work with are food brands, all the campaigns have centred around our psychological relationship with food. As you will see from the case studies, I work with companies from the early research development and analysis right through to promoting the story to the media.I’ve hosted over 20 radio days, presented online videos, hosted media events, conducted research, created bespoke quizzes, written articles and press releases. If you are interested in finding out more about my services, packages and prices download my free guide below. To discover my top tips and insider secrets, download my FREE '3 Ingredients For An Awesome Food Brand Campaign' guide by entering your name and email. Inside I talk you through the key ingredients every food brand campaign needs to be successful, along with a detailed rundown of my services. PLUS I will also send you a handy one-page guide perfect for giving to your clients or team members! Soreen wanted to commission research into the link between hunger and anger aka Hangry! For the campaign, I designed and conducted a series of research trials investigating ‘hangry’ and the effect of hunger on our ability to make important decisions. Following the trials, I analysed the data and wrote a research paper detailing the findings. Using this research, my expert comments and the findings from a large-scale survey they created the press release and pitched the story to the press and national radio stations. I then hosted a radio day to discuss the research findings and key campaign messages. I also presented an online video for them discussing how to stay focused during exam revision. What I loved about this campaign was how unique it was. Most campaigns rely solely on consumer survey research. By commissioning an in-depth behaviour study Soreen had a unique piece of research to take to the media. If you think your campaign could benefit from a bespoke behaviour study, please get in touch. If you are interested in pitching this idea to your client, I can provide you with a detailed research methodology and research proposal along with a breakdown of costs and timescale. Run in partnership with integrated creative agency The Red Brick Road. Seasonal Berries are passionate about all things berries. I have worked with them on two campaigns to date. They first commissioned me to write an article for Valentines day on the role of berries in boosting libido. The article was then used as the press release. Below you will find a handful of the links to the press coverage. Following the success of this first campaign, I was commissioned again to research the benefits of eating berries and craft 5 top tips for including more beautiful berries in the diet. After conducting the research on berries, I drafted a short article outlining my top 5 tips for avoiding the afternoon slump packed with ideas on how to include more berries in your daily diet. Yum. As a published author and freelance writer, I love helping food brands create fun and engaging content for their campaigns. I provide examples of my writing and the different write-up options available in the 'Packages & Prices' section. You will also be able to download a copy of the berries article to get a feel for my writing style. Run in partnership with The Red Brick Road. When Lyles Golden Syrup decided to create their first ever smile-activated syrup dispenser, they wanted to create a some hype. To help drum up media interest, they commissioned me to conduct a literature review on the benefits of breakfast, smiling in the morning and investigate how contagious a smile is. Using the review combined with a research survey and my expert quotes they drafted a press release and pitched national radio stations. They then ran a radio day where I worked as their spokesperson for the “Smyles With Lyles" campaign.The following day, they set up the first smile-activated dispenser in Victoria Station in London giving away porridge with golden syrup to commuters. Needless to say, the campaign was a hit! Along with short media friendly articles, like those written for Seasonal Berries, I can also research and write more comprehensive literature reviews. These are a great way to provide more depth to your campaign story. I provide examples of my writing and the different write-up options available in the 'Packages & Prices' section. I have also included a copy of my 'Smyles With Lyles' literature review in that section for download. Loch Fyne Seafood & Grill asked me to represent them as their spokesperson for their upcoming radio day on food phobias. They had commissioned a large scale UK based survey into food phobias and discovered that many people were freaked out by ‘fish with eyes’. Using the survey research, I provided expert quotes on food phobias for their press release. I was then interviewed by various national radio stations as part of their radio day for the campaign discussing how we could overcome phobias to foods like fish and seafood. You will find more details on my radio day package in the 'Packages & Prices' section. Put Pork On Your Fork hired me as their expert ambassador to work alongside celebrity Masterchef winner and TV presenter, Nadia Sawahla. As part of the campaign, Nadia and I became the faces of their website and I provided expert quotes. We also represented them on air during a radio day discussing how to boost your mood with food. Following the radio day, we shot a series of online videos on how to boost your mood with food. You will find more details on my radio day package in the 'Packages & Prices' section. You can watch more video clips from other campaigns and TV work in the 'Online Video Presenting' Section. Run in partnership with Finn Communications. O2 priority moments asked me to represent them on air as their spokesperson for their radio day promoting their £1 lunch deal. They had commissioned a large scale UK based survey and discovered that most of us are not having a proper lunch break. The key message was that we should take the time to enjoy our lunch away from our desk with the £1 lunch deal. Using the survey research, I provided expert quotes for their press release. I was also interviewed by various national radio stations as part of their radio day. Following the radio day, I presented an online video from Soho on a giant picnic bench they had created for the campaign. Knorr prides themselves on created amazing flavours. To celebrate National Homemade Soup day they commissioned me to investigate what your favourite soup says about you. I helped their PR team design a large scale consumer survey investigating our love of soup. Using the research findings, I created a short, engaging quiz which we promoted on social media. I then hosted a radio day on National Homemade Soup day discussing the findings and encouraging listeners to make a pot of delicious homemade soup. 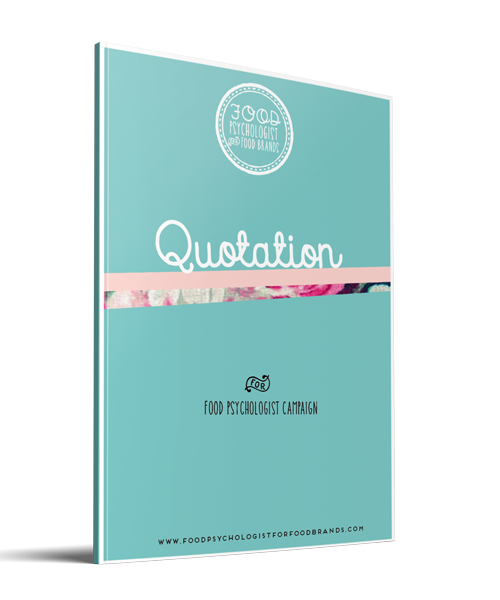 Fun and quirky food personality quizzes are a great way to engage with your audience. 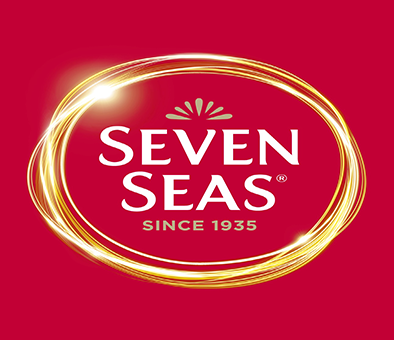 I have created these for a number of food brands with incredible success. 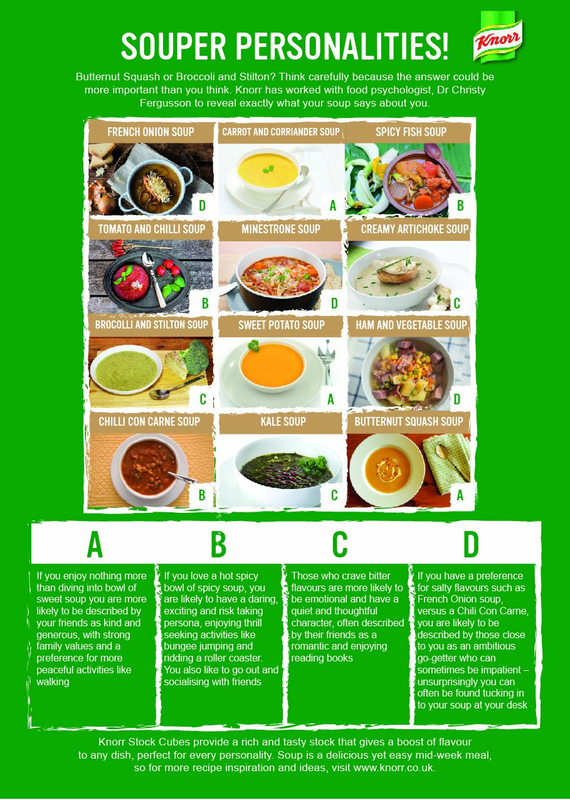 This can be used to create an infographic like Knorrs Souper Personalities Quiz (see below) or you can add the quiz to software like Woobox. This is what Ask Italian did with their Temptation Test (see below). To find out more about food personality quizzes check out the 'Food Personality Quiz' Section. Tilda are passionate about wholegrain goodness. 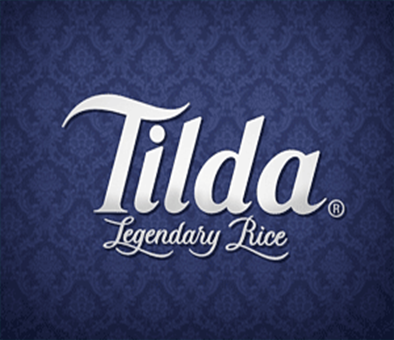 I have worked with them on two campaigns helping them promote their legendary rice. For the first campaign I worked alongside dietician Dr Sarah Schnecker. Dr Schenker had been commission to write a Mood Food Manual for Tilda and I provided expert comment for this from a psychological perspective. Together we then hosted a radio day for Tilda promoting their Mood Food Manual and encouraging listeners to download this free mood food guide packed with expert tips and recipes Following the success of of the mood food campaign, Tilda then invited me to host a second radio day on my own. To celebrate National Desert Day, Ask Italiancommissioned me to investigate what makes food irresistable and how different people resist temptation. Based on my findings I created a short, engaging quiz called the Temptation Test which revealed your temptation personality. I then hosted a radio day on National Dessert Day discussing the findings and Ask Italians, most tempting dessert their Chocolate Lava Mountain. Fun and quirky food personality quizzes are a great way to engage with your audience. 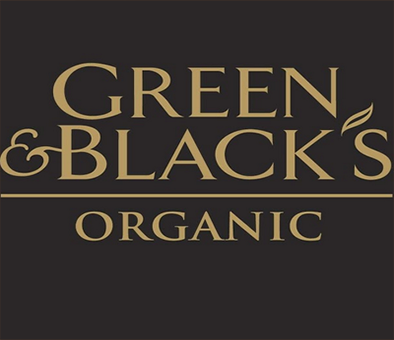 I have created these for a number of food brands with incredible success. This can be used to create an infographic like Knorrs Souper Personalities Quiz (see above) or you can add the quiz to software like Woobox. This is what Ask Italian did with their Temptation Test. To find out more about food personality quizzes check out the 'Food Personality Quiz' Section. Dr Christy has a very easy interview manner and was superb at building rapport with presenters. We would love to speak to Dr Christy again on other topics related to the psychology behind food.